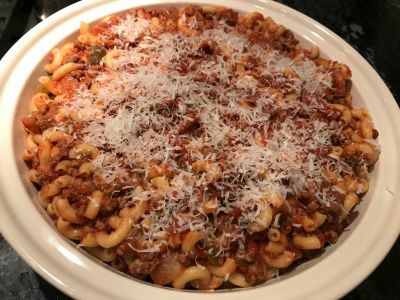 Every kitchen in New England has some form of recipe for American Chop Suey. 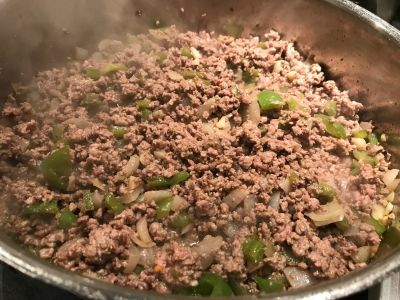 In it's simplest form, it is garlic, onion and bell pepper sauteed and cooked with ground beef and tomatoes. Add a few herbs and that's it. Very easy to do and the true definition of comfort food. 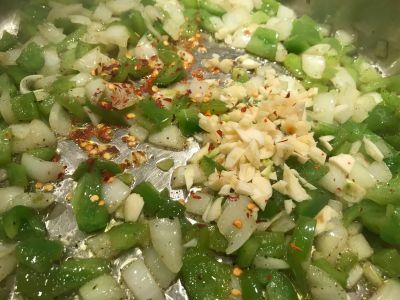 One ingredient I like to add that is somewhat out of the ordinary is crushed red chile flakes. 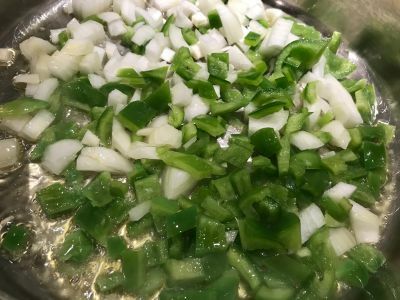 It adds a slight level of heat that adds more intensity to the flavor but is really not discernable unless you are very sensitive to heat. 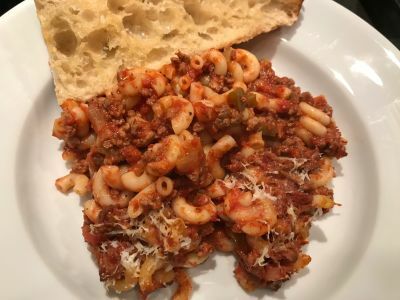 So let's get started with this recipe and then you can tell us how you changed it to make it your own. We love to get feedback on how you like it. Have fun, I'm sure your friends and family will love it and keep coming back for more! 1. 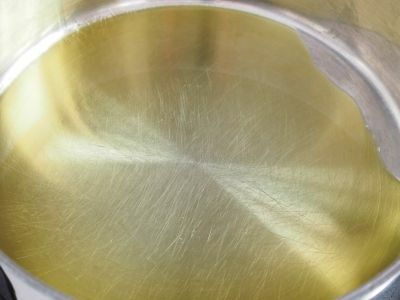 Heat olive oil in a large pot over medium-high heat for about 2 minutes. The pan I am using is a 12" stainless steel saute pan. You could also use a dutch oven. 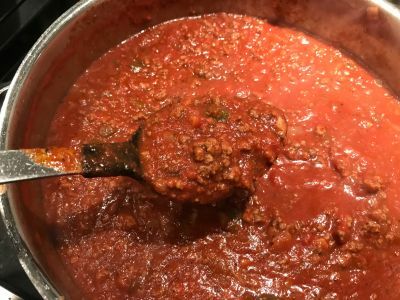 Just make sure it is large enough to hold the sauce and the pasta once it is cooked. 2. 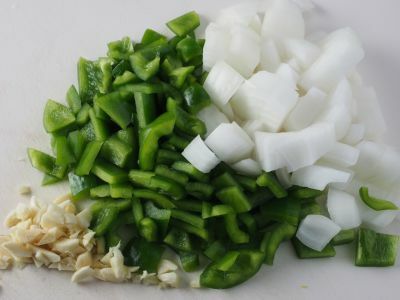 Add onion and green pepper and cook until softened, about 3 minutes. 3. Add the garlic and red pepper flakes and continue to cook for about 2 more minutes. 4. 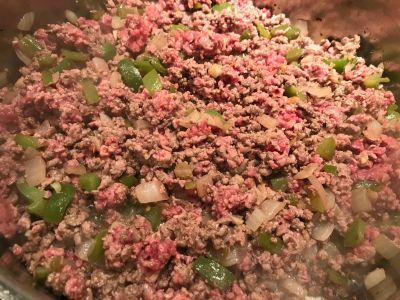 Add ground beef and cook, stirring occasionally, until meat is no longer pink, about 5 minutes. 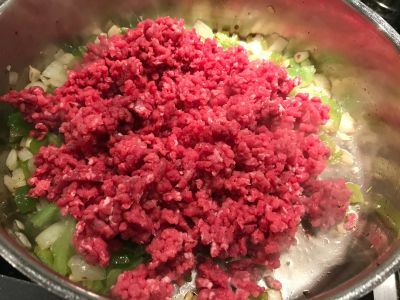 The ground beef I am using is actually a round steak that I ground at home. 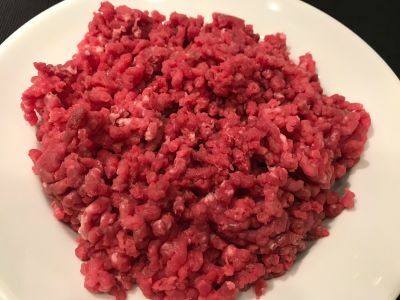 There is no comparison between beef ground fresh at home and that bought at a grocery store. And you'd be surprised, most times it's cheaper. 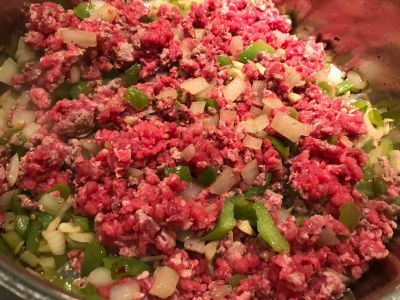 Also, use a lower fat ground beef. We don't want a lot of extra fat in this. 5. 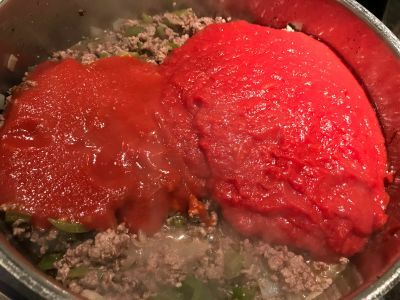 Add in tomatoes and the tomato sauce and stir in with the beef/vegetable mixture. 6. Add in the basil, oregano and salt and stir to mix. 7. Stir thoroughly and bring to a simmer. Cook uncovered for 20 minutes over low heat or until the sauce has thickened slightly. Remove from heat. 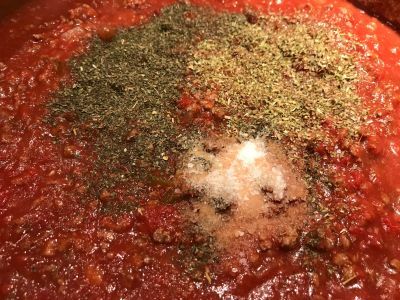 At this point, taste the sauce and if it is a little bitter or acidic, add a half teaspoon of sugar. Be careful with the sugar, it doesn't take much to make it way too sweet. 8. 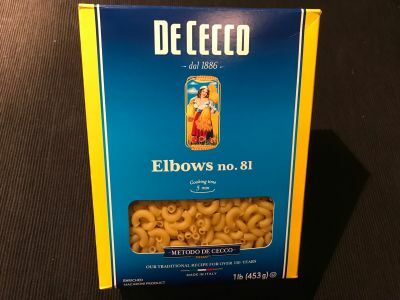 Cook the elbow macaroni until just al dente or even slightly before that stage. 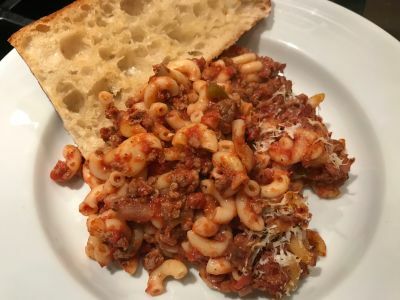 I always use DeCecco pasta because it holds up really well to cooking and cooking it al dente is pretty easy. On the package it said cook for 5 minutes and I checked it along the way and 5 minutes was about right. Try not to overcook the pasta here. It will cook a little more when you mix it with the sauce. 9. 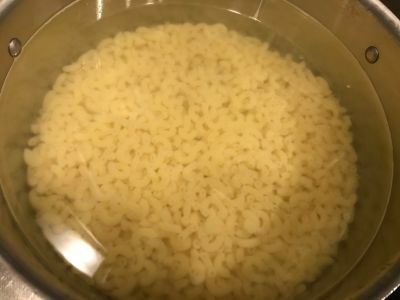 Run cold water into the pasta cooking pan with the macaroni until the macaroni is cooled. 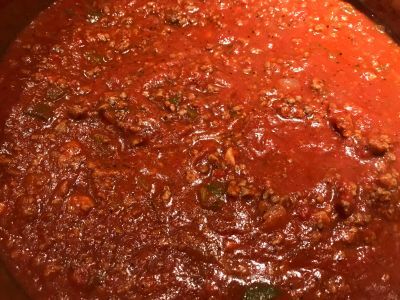 If you are going to mix it with the sauce and eat it right away, you can skip this step. 10. 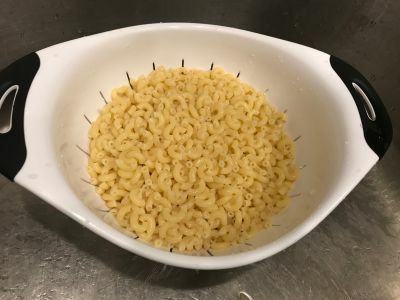 Drain the macaroni well and mix with the sauce. 11. 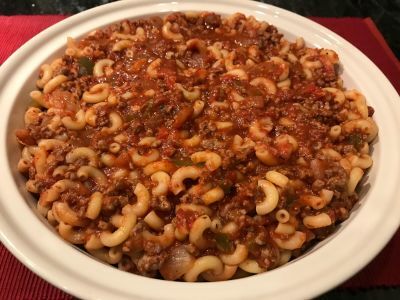 Your American Chop Suey is now complete and you can serve it and eat it just like this! Good job!! 12. 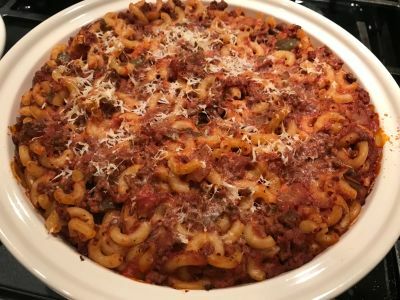 If you are not going to eat it right away, put it into a casserole dish and set it aside. You can add some cheese on top or not, your preference. If you are going to bake it, you want to make sure you cooled your pasta down earlier by running it under cold water. 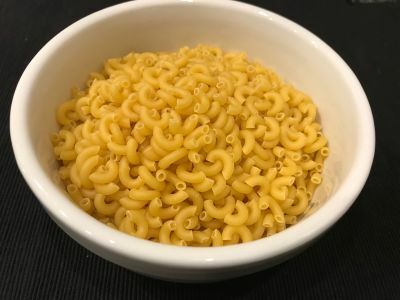 If you don't the macaroni will continue to cook and will absorb too much liquid. 13. Bake in a 350 degree oven for 30 to 60 minutes until it is heated all the way through. You don't need to "cook" it here. Everything is already cooked, we are just reheating it. And that's it. 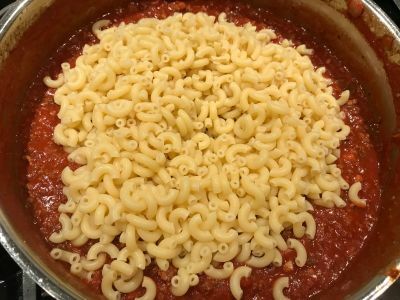 You are now an expert at American Chop Suey. And I can hear you now; but can i add this to it or do I have to use this much of this ingredient? No worries, just share with us how you "Make It Mine." We would love to hear from you. My fave comfort food. Grew up on it!